Transcript - Inaugural Poem - Text - NYTimes.com Someone is trying to make music somewhere with a pair of wooden spoons on an oil drum with cello, boom box, harmonica, voice. Poem's like these were being written during communist transitions by greats like Mayakovski, Nezval or Seifert. The imagery was great and beautiful. 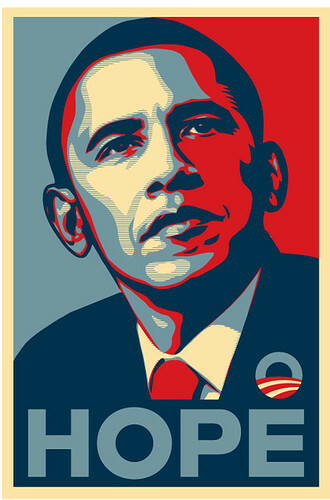 As was the imagery of the Chinese cultural revolution of which Shepard Fairey's icon is more than a little reminiscent. Paradoxically, leaders helping out in charitable efforts was not part of the inventory of socialist realism and it is a significant part of the expressive inventory of US political discourse. And just like these two images, Soviet Union of 50 years ago and the United States of today evince as many similarities as differences. But why any similarities at all? And do they matter? I would argue that the similarities are a consequence of what I call the logistics of language and culture. Simply a result of the necessity of getting from point A to point B. Language and culture are not just there to carry our messages and interactions. They have to carry their own weight just like much of the structure of the bridge is there just to support the weight of its own materials and the personnel of a marching army includes as many of those deal with food, fuel and excrement as those shooting guns.